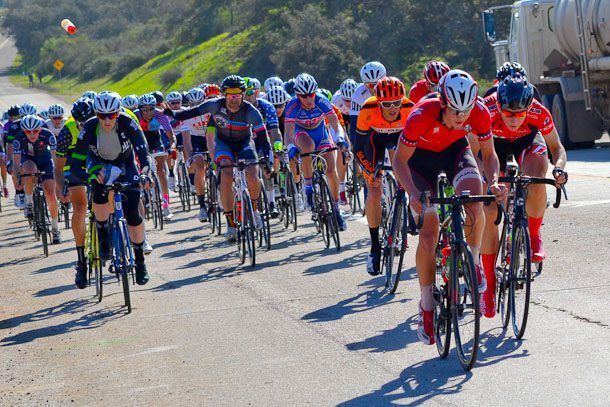 As the first Road Race and, for many, the first race of any kind of the season, Santa Barbara County Road Race or formally “Poor College Kids” is always an exciting day. You can sense the nerves in the riders as you approach the registration station. Everyone is doing their best to mask their obvious anxiety. Today, there was also a bit of rain and wind which added an extra edge to the athletes’ demeanor. This race has always been difficult for me. The short-length but punchy hill at the end of each lap will typically soften everyone’s legs and make for a tough day. On top of that, the guttering winds on the lower, flat part of the course will put riders under duress and make for inevitable attacks or at least a strung out group. Today’s race was pretty straight-forward compared to years past. Five riders attacked right from the gun after the neutral car pulled off and their respective teams defended them all day, chasing down any potential bridge efforts and neutralizing them immediately. The roads are narrow, so additionally it was difficult for riders to position themselves for bridge efforts. So, the first move of the day was the only real move of the day. It was also the winning one, boasting a victory from a Canadian National team member who rode for the Silber Team, wearing an Orange and Grey kit. As I heard, the winning rider attacked on the 5th (of 6) laps just before the hill and made it all the way to the pay line. Congratulations to the winning rider, Matteo Dalcin. On the final lap, the group reluctantly but finally submitted to the inevitable idea that the breakaway had succeeded. So, it maintained a casual but constant pace. At this time, a few riders took their last chance to get up the road without any challenge from the groupetto. One of these riders, Inno Zayvalov (SoCalCycling.com Team), was lucky enough to not only bridge to the [exhausted] breakaway, but also continue up the road from the breakaway in order to earn a second-place finish behind an already-gone race-winner. Congratulations to Inno on his last-chance effort of success. The remaining breakaway riders succeeded in their journey to fulfill the remaining top 7 spots. Other fore-mentioned riders who departed from the main group were eventually caught at the top of the hill and took part in the field sprint to the line which was certainly a nervous run-in with the riders having a long day in their legs. Two riders were able to attack at the top of the hill in order to beat the sprint group and finish eighth and ninth place. The Sprint winner took 10th. It was a beautiful day in the Santa Barbara Wine Country and a fantastic start to the racing season. We all look forward to more days of this quality. Until next time, train hard and race smart.